The organisation came back from the brink during the noughties after years of financial instability. DESPITE BEING A staple of Dublin and one of the most popular visitor attractions in Ireland, there was a time when the capital was faced with the possibility of losing Dublin Zoo. The organisation was nearly on its last legs financially at the turn of the millennium and if it wasn’t for government intervention in 2006, the zoo may well have been forced to close its doors for good. “I walked in 15 years ago and I scratched my head,” says Leo Oosterweghel, the Dutchman who joined as director of Dublin Zoo from Melbourne Zoo in 2001 to try and reinvigorate the organisation. 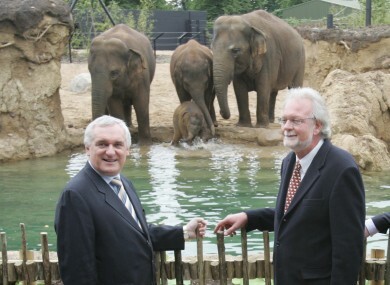 On a worldwide basis, state backing in zoos is quite rare, according to Oosterweghel, who says Dublin Zoo has one man in particular to thank for ring fencing the €18 million in funding that has helped bring the organisation back from the brink – former Taoiseach Bertie Ahern. “Bertie genuinely cared about the zoo and the botanic gardens because he grew up not too far from here. That’s genuine, as they say in Ireland. Four years ago, the government financial support to the zoo came to an end and since then, the organisation has been forced to stand on its own. Oosterweghel says Dublin Zoo, which is run by the Zoological Society of Ireland, has climbed out of the hole after being “touch and go” and has hit a record number of visitors for 2016 already. Around 1.3 million people have passed through the gates so far this year compared to 1.1 million during all of 2015. He explains that the organisation now operates on a model he has dubbed “the golden circle” whereby Dublin Zoo plans to reinvest in a new revamped attraction every year. That surplus is usually between €2 million and €4 million, and according to filings for 2015, the excess stood at €2.6 million, which was a decrease of €165,000 on the surplus registered in 2014. Even though Dublin Zoo is back on its feet, the organisation is very “conservative” in its approach to new projects, according to Oosterweghel. It only spends what money is in the bank. However, there is also a rainy day fund totaling around €2 million to cater for a disaster event – like the 2001 outbreak of foot and mouth disease. Oosterweghel hints that the next project, which he is yet to get sign-off for, could see Roberts House, the tropical bird enclosure built in 1902, get a face lift and possibly a new function. But we will have to wait until next June to learn what that is. From a business point of view, the zoo can be quite baffling to accountants. Some of the organisation’s most valuable assets are its collection of animals, but none have a price on their head and are effectively worth nothing. Oosterweghel says this is all because of a collaborative effort by zoos worldwide that sees animals moved between zoos, at no cost, if it is best for the species. “We take our guidance from a stud bookkeeper, so you have 250 Sumatran tigers in the world and the stud bookkeeper calculates that a male should be with that female because that’s a good match on paper. He added that it can be tough to be asked to let go of animals and send them to a different zoo, but under this approach it will mean more breeding, which will mean more new arrivals that help create spikes in visitor numbers. Some recent new arrivals at Dublin Zoo include an Asian elephant calf and baby rhino named Zuko. Newborns are one of the few tools Dublin Zoo has to entice new people through the gates and usually sees the organisation get wall-to-wall media coverage. Oosterweghel keeps a keen eye on the coverage Dublin Zoo gets in the media using a rather old-fashioned method – a scrapbook. He cuts out every article about the zoo, good and bad, and also has reviews from Facebook and TripAdvisor printed out. Welcoming new life into the zoo is one of the highlights of his job, says Oosterweghel. As a researcher at heart, he says he learns something from each new animal that is born at Dublin Zoo. However, in the job, there is also a fair share of death to deal with. A few months ago, the zoo lost its famous gorilla, Harry. These sort of moments can be some of the toughest times for the organisation to weather. “We didn’t want to lose that gorilla. He was only 29-years-old but he had a stroke, which we only learned about after the postmortem when we looked at his brain. That’s a real low point because he was the leader of that troupe. Another potential low-point Oosterweghel thought could throw the organisation off its rebuilding phase was the global recession that hit in 2008. But as Oosterweghel puts it, the financial crash ended up being “nothing major” to the organisation. “We explain it like this, people stopped going on holidays, so people did more staycations, but they still wanted to do something worthwhile. Now into his sixteenth year at the zoo, Oosterweghel seems very content to keep going and gives no hints that he is ready to hang up his boots. He reaffirms he is committed to staying at the zoo and continuing the project he started at the turn of the millennium. Oosterweghel is equally tight-lipped when pressed about who his favourite animal is for fear of other animals – or more likely their keepers – finding out. “I like what I’m doing and it stops being work. Just imagine if you are the manager of a football team and you keep winning, that’s pretty cool. It’s stressful, but if you keep on winning, that keeps you going. Email “It's part of the furniture but without a Dutchman and Bertie, Dublin Zoo could have shut forever”. Feedback on “It's part of the furniture but without a Dutchman and Bertie, Dublin Zoo could have shut forever”.